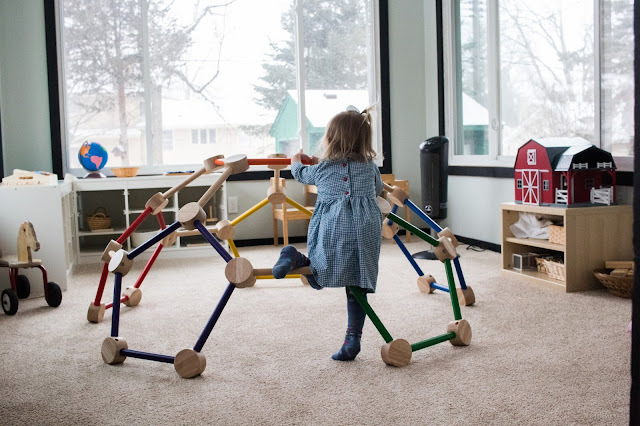 While Maria Montessori did not specifically create work for infants, Montessorians have created guidelines for infant environments. An integral part of this environment is the visual series of infant mobiles. 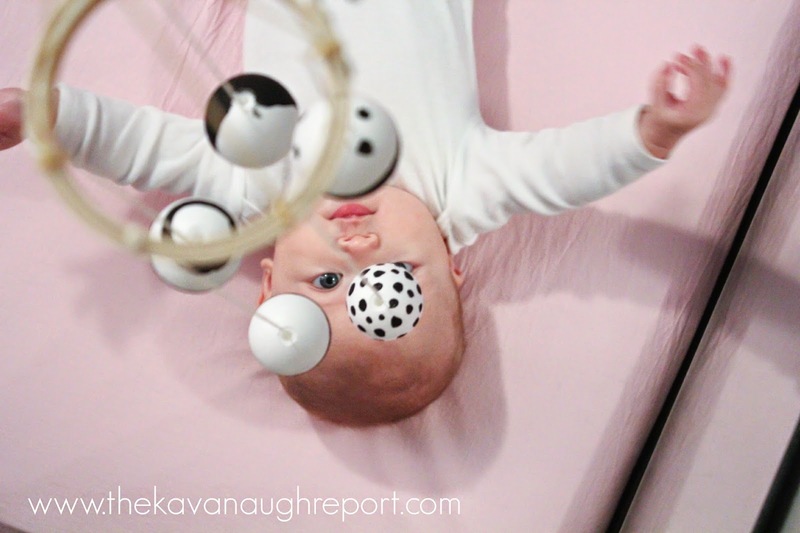 The mobiles themselves are all developmentally appropriate for babies. 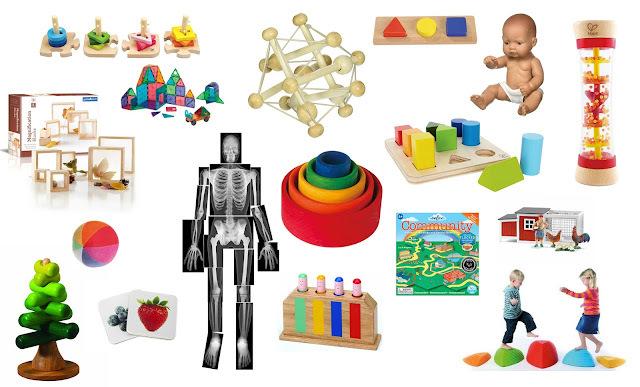 They help to develop concentration, hand-eye coordination, depth perception and other essential skills. Plus, they are wildly entertaining for babies. 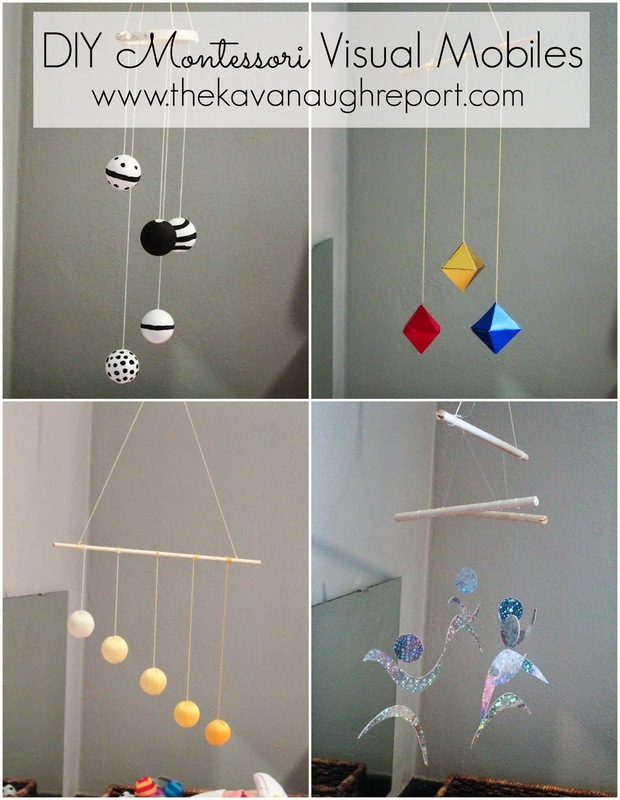 The first set of mobiles are visual mobiles, meant for the baby to look at. I have made four of these -- all DIYed on the cheap! Munari Mobile -- this is the first mobile in the visual series. It can be used starting at birth. I did not make a true Munari, but a Munari inspired mobile. I used small Styrofoam balls that I had left over from the Gobbi. I painted black patterns on them, and hung on a small ring at varying heights. I hung it so the lowest ball was a few inches above Nora's body but still out of her reach. Nora loved this mobile. It kept her attention from birth. And she would stare at it for long periods of time. We used it from birth until around 7 weeks when I noticed it was no longer keeping her attention like it used to. 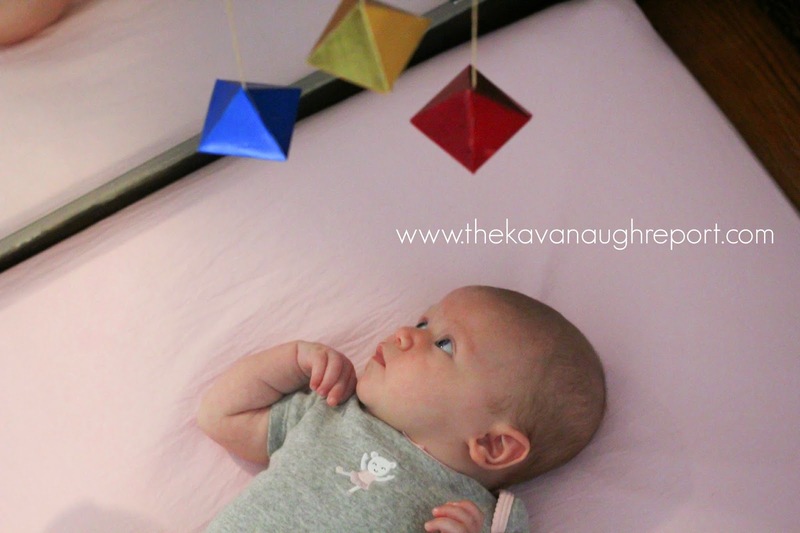 Octahedron Mobile -- was the second visual mobile that I made for Nora. It consists of three octahedrons made from metallic paper (typically Red, gold, and blue) and hung at different levels. I followed the tutorial at Little Red Farm to complete it. The only thing I did differently was that I used superglue to hold the paper together. I tried double sided tape at first, but couldn't get it to actually keep the paper together. This was the most frustrating of the mobiles to make and required several attempts before it was actually correct. But, it was worth the hassle. Changing to this mobile was the first time that I saw Nora respond to a change in her environment, which was awesome. We used this mobile from 7 weeks to around 12 weeks. 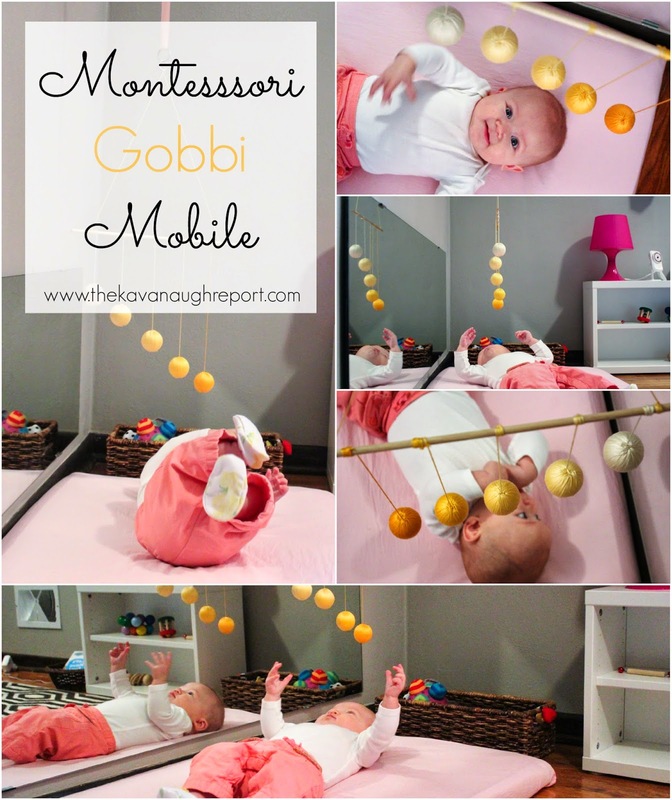 Gobbi Mobile -- this mobile was the first that captured my attention when I was learning about Montessori newborns. It is a mobile with 5 different balls hung on a 45 degree angle from lightest (shortest) to darkest (longest). The balls are all a shade of the same color and usually made with string/embroidery floss/yarn. I choose yellow because it matched Nora's room and I wanted something gender neutral in case we had another baby. This mobile was very time consuming to make and took me weeks while I was pregnant. I had a lot of fun making it though and I'm happy I took the time. Nora really likes this mobile. Unlike the other two, she's much more animated with it, she talks to it, tries to grab it (it's hung higher than her reach), and laughs when it moves. We started it around 12 weeks and we are still used it until about 15 weeks. Dancer Mobile -- at this point, this is the last of the visual mobiles I've made. It's a beautiful flowy mobile meant to look like people dancing in the wind. I sort of just did my own thing with this mobile -- using a colorful, shimmery, reflective paper, I free handed the figures. The hung them with fishing wire and wooden dowels. 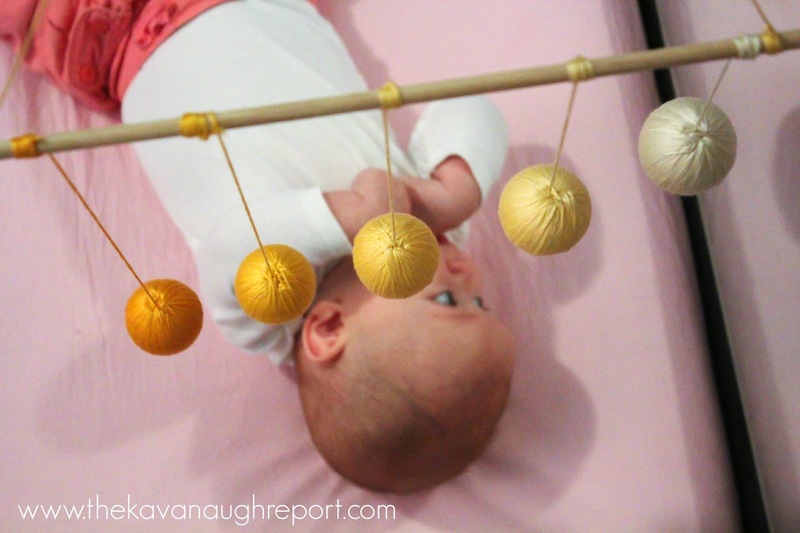 Nora really enjoys this mobile (and its the one we still use today at 4 months). This is her favorite to watch move in the mirror and not just from under it. The way I have hung the mobiles (binder ring attached to a ring that is permanently attached to a ribbon) it is easy to interchange mobiles depending on Nora's mood, the time of day, etc. 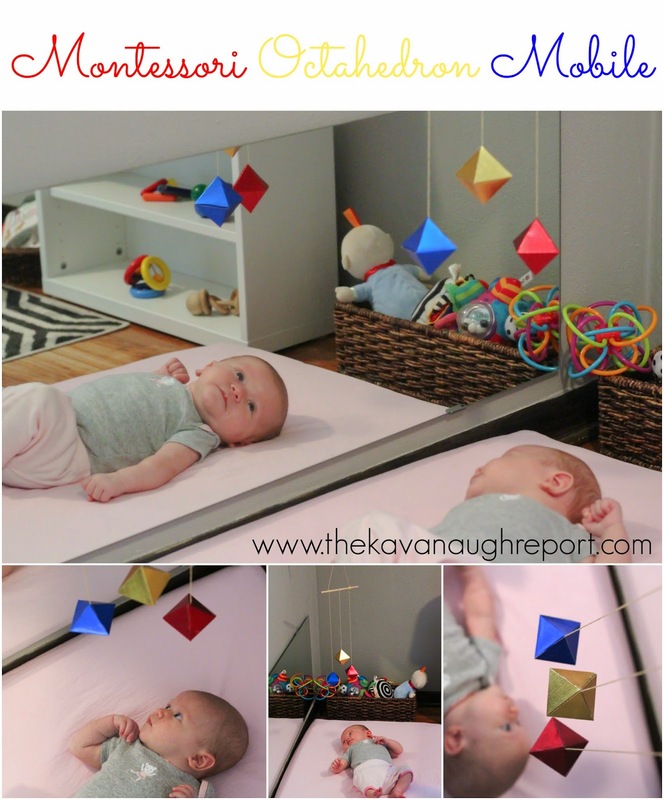 There are many other mobiles that you could choose to make and use with your newborn. There are the whale mobile, rainbow ring mobile, the butterflies and many other appropriate and stimulating mobiles. But, for us, these were the best. Now it's time to move on to the tactile mobiles -- I'll save those for another post! 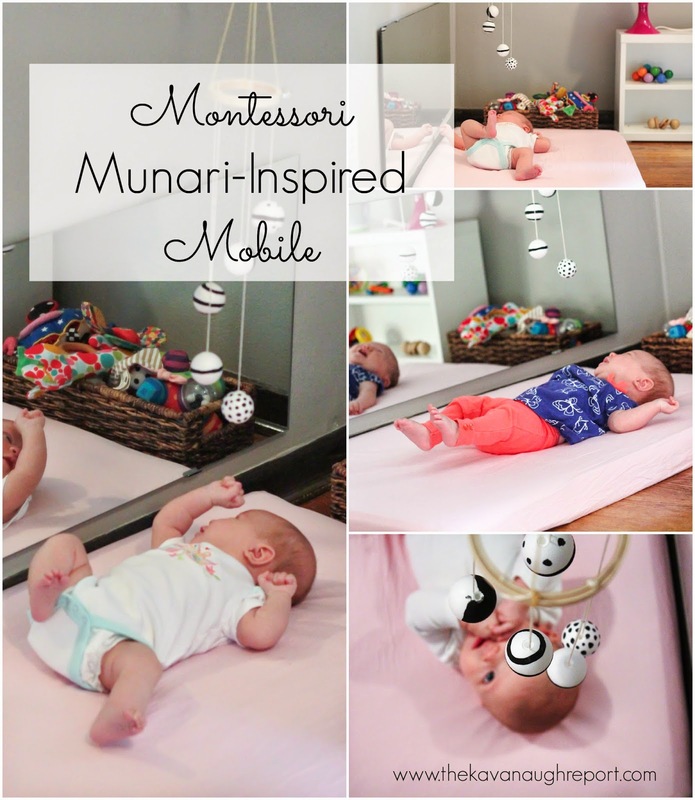 Do you use Montessori mobiles with your baby? Which ones were your favorite? Great post Nicole! 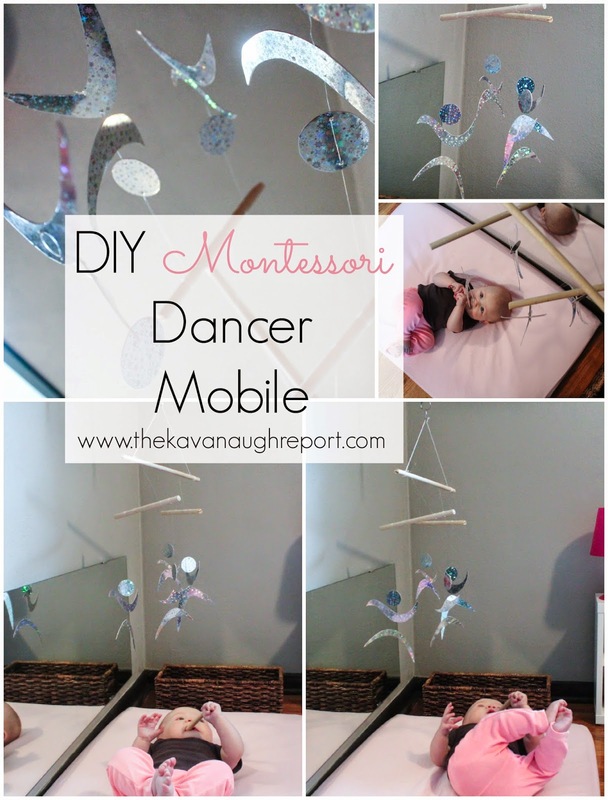 Love seeing the progression of your daughter's development through these mobiles. She looks like she thoroughly enjoyed each one in a different way, perfect for each stage of her development. I found the octahedron the easiest to make! Perhaps it depends on the material used. I used a thick, shimmery scrapbook paper, like a thin cardboard. 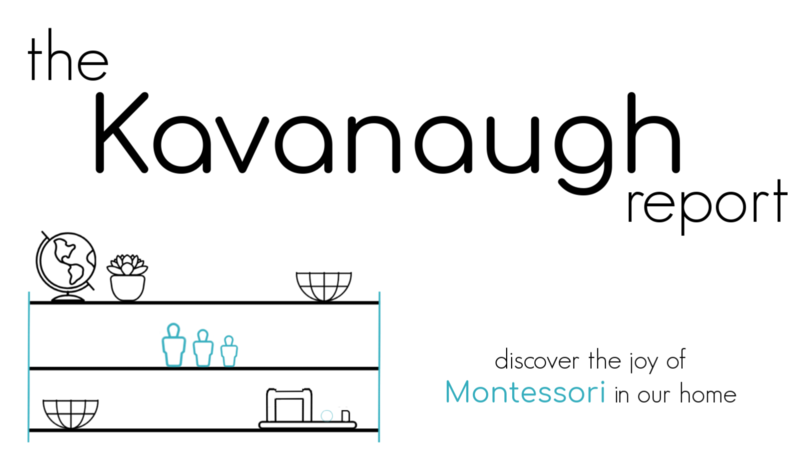 I found the Munari (I made the traditional one) the most challenging to actually balance. Thankfully my husband helped me out! Thanks for sharing! 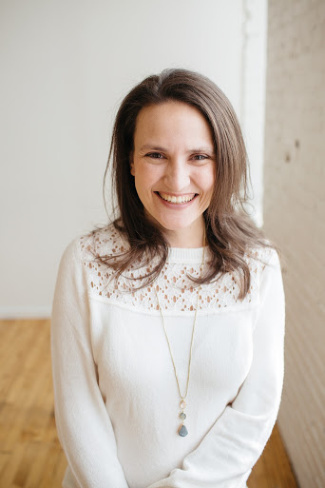 This is so perfectly timed -- I have all things Montessori baby on the brain right now. I especially love your sparkly dancers. Great post! Loved all of these. I wish I had known about Montessori when E was this age. If we ever have another, I will definitely be making some of these. Love these, Nicole! I would love to get into making some of these! hi Nicole! I love this article so much. I am now in my 7th month expecting and wonder if i can make those amazing mobiles by myself. the problem is that I have just moved to Germany and don't know the name of the materials i need (in german) as well as where i can get it. Do you think it is possible to make the gobi mobile with pompom? as I only can find the yarn (wool). thanks in advance for any respond for me. Is there a reason the Gobbi mobile has to be made of floss?Can it be painted? nice mobile article to show.